It’s not often that a first-party PS Vita title makes an appearance since the system’s launch in early 2012. The handheld has been almost begging for a killer title (at least in the West) and, unless you’re an avid Japan importer, your game library is looking lonely. 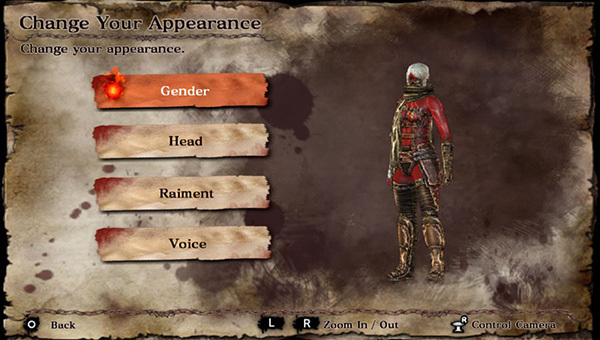 So here we have Soul Sacrifice, a creation spawned from the mind of Keiji Inafune who co-designed Mega Man. Mixing the successful monster hunting formula with a dark narrative and macabre art design, is this a much-needed system-seller? 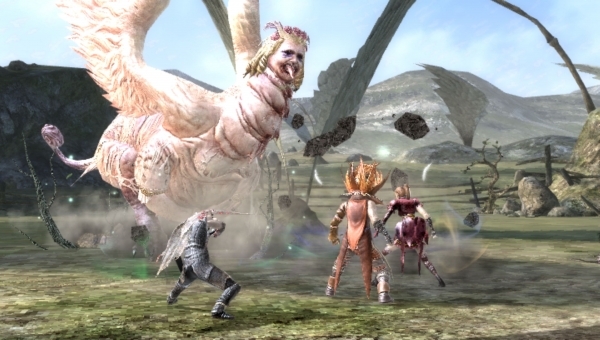 From the opening seconds of the game, the universe of Soul Sacrifice is a bleak one. A heartless sorcerer enslaves and sacrifices the souls of innocents, and the protagonist happens to be just one of many trapped in a cage with no future. 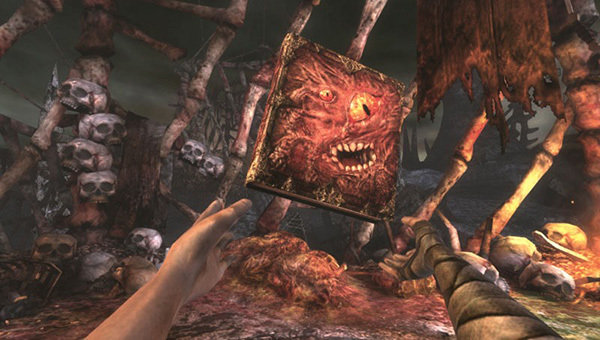 Within reach of the player happens to lie a talking, demonic book which belonged to a powerful sorcerer and serves as the game’s hub in progressing through the story and levels. The player essentially rewrites the book in his or her own name, placing themselves in the diary of events that happened previously. You play through the eyes of a sorcerer as he undergoes the Sorcerer’s Ordeal, which are really just a set of standard set of levels with bosses, along with a female companion named Sortiara. 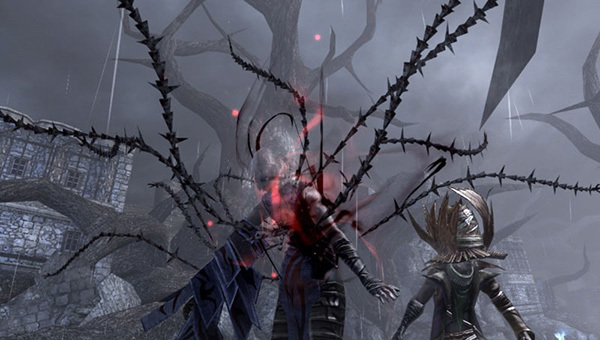 As the protagonist plays through these past memories and grudgingly becomes close to Sortiana despite the two’s lethal enmity to everything around them, the player’s real character in the cage learns the skills and ability necessary to eventually challenge the one who imprisoned you. What’s really cool is that you can choose to fight the sorcerer whenever you want, just don’t expect to win until you thoroughly develop your character. I would have liked to see story development while inside levels, as they are simply arenas for you and your companion. Only when you clear the level does the narrative progress within the journal. Unfortunately, while very compelling the story doesn’t go the extra mile to really draw you in. The voice-acted text (the voice-acting itself is great though) and few cutscenes make it difficult to craft a truly great narrative in a 3D action-RPG. Soul Sacrifice will mainly see you going inside the talking journal, Librom, to undertake and progress through the various chapters while collecting powers known as Offerings and customising your character with these. The field of battle feels like a typical RPG as you sprint around killing any enemies that show up and either sacrificing them for a boost in magic power or saving them for vitality. While the game likes to hammer in the fact that there are consequences for sacrificing everything, but the fact is it isn’t strict enough. You can always recover by using Librom’s tears that you can collect occasionally and powers can be recharged in-battle. Combat is straightforward but very satisfying. You activate an equipped offering and unleash chain attacks or a long, charged up strike. Offerings are outrageously awesome and vary from a massive stone fist to shooting your own blood at the cost of your health. The greatest attack in your arsenal is the ultimate sacrifice. When your health is low enough you can engulf yourself in fire, for instance, dealing a lot of hurt to enemies all around. This handicaps you, however, such as lowering your defence until you can reverse the effects with Librom’s tears. You will always have an AI companion with you and they’re always welcome help. Once you die you can choose whether they save you so you can fight again or to sacrifice you. In multiplayer the AI is replaced with a real player and fights can get a whole lot easier, as the AI can even get in the way instead of providing real support sometimes. 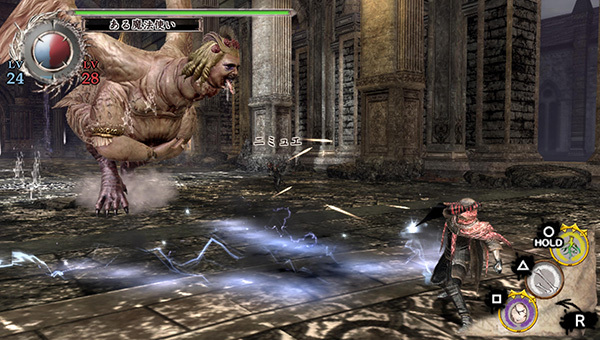 The bosses are fairly tough and after killing waves of standard enemies the difficulty spike will surprise a few. Pleasingly, the bosses are fittingly insane and can be fearsome to face. 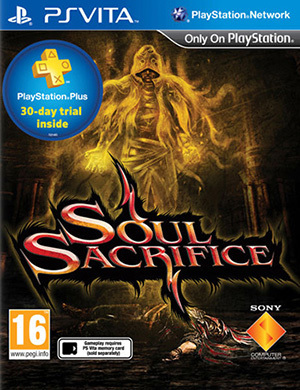 Soul Sacrifice seems like a fairly high budget endeavour as it is supported by Sony Computer Entertainment itself. It definitely shows in the visual direction of the game, with some superb animations and creative art design. The magic charging effects and Offerings can sometimes feel spectacular and you’ll probably smile to yourself a few times as you feel like a kid powering up attacks. The game’s art is of dark fantasy style, allowing for some amazing enemy designs that range from the bizarre to the disgusting. Having said that, the game still doesn’t feel like a full-blown PS Vita title as it looks a little blurry and rough around the edges. With the amount that’s going on on-screen during a boss battle though, you can imagine the framerate drops would be a whole lot worse with better graphics. 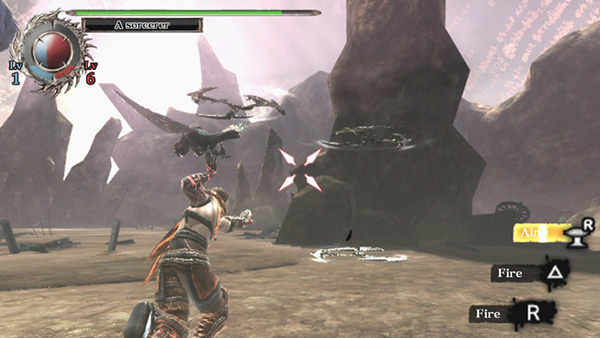 The dark and miserable tone of the game doesn’t allow for much colour, so that could explain the dreariness of the visuals in general. 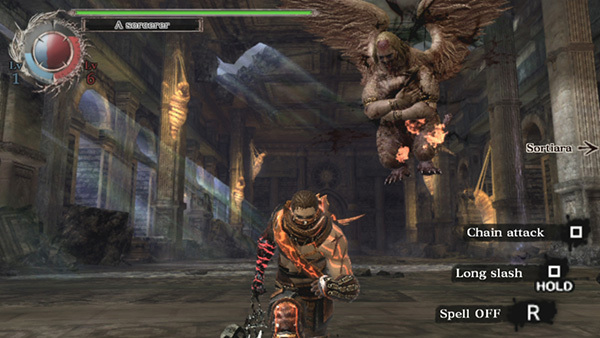 The music in Soul Sacrifice is definitely a strong point. Sad and forlorn melodies mixed with some epic orchestral battle music make this a memorable sound track. Voice-acting is stellar, with the fantasy theme complemented by some English accents and brooding monologues. Librom’s voice in particular is great, sounding just as a talking demon book should. 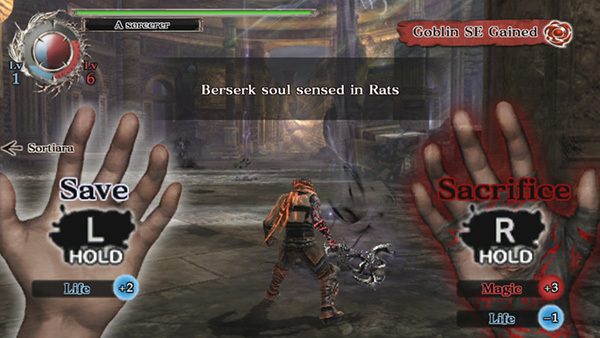 Soul Sacrifice was an interesting experience. As someone who never really enjoyed the Monster Hunter style of games, I got a good kick out of this title. The story wasn’t as deep as I would have liked, however, and while battles were very cool and satisfying the environments weren’t varied enough to keep up the excitement. This is still a good JRPG, one that is desperately needed for the PS Vita in the Western market. It may not be a system-seller or a killer title but if you own a PS Vita, Soul Sacrifice should be seriously considered. The dark fantasy theme reminds us of RPGs from the grim 90s and the amount of creativity behind it warrants a look.